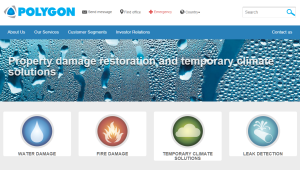 Polygon is the European market leader in property damage restoration, serving a range of sectors including insurance, property management, government and industrial clients. Abiro designed and built a site and related apps for ordering jobs to be made regarding water damage etc. The site and functionality was created using CliqTags, Abiro’s flexible mobile CMS. Apps were made for Android and iOS to simplify use, but the service can also be used via a browser.